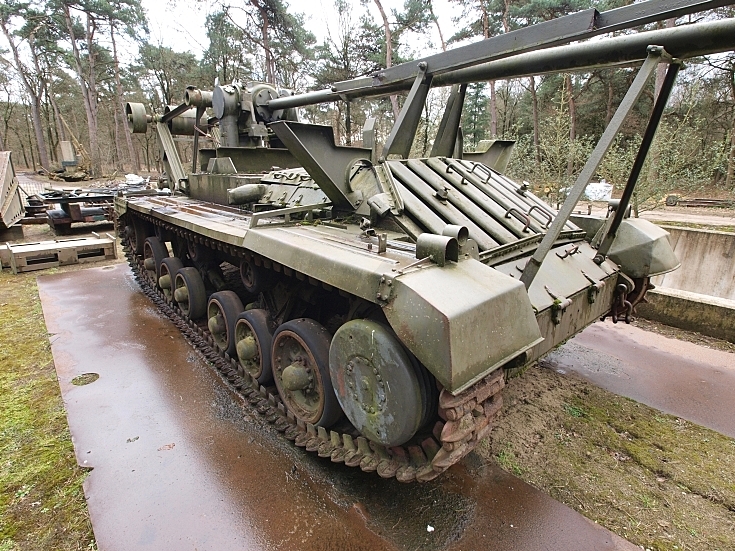 Photo of a Valentine AVLB (Armored Vehicle Launched Bridge), at the Marshall museum, Overloon, The Netherlands. Basically it is a turretless Valentine Mk II fitted with 34 ft x 9.5 ft scissors bridge. Several dozens were produced, of which some where supplied to the USSR. Now by the end of 2012 the restoration is almost completed. But who knows or owns one of those long threaded rods, which is needed to make the scissors movement of the bridge parts? We need one! I know that the Dominions of the Dutch War Department has some 7 or 8 after WWII in around 1947 in their depots. Added by Wil C. Elbers on 25 November 2012.